Jolly music, baby-ish graphics and symbols; my 4 year old took great interest in what I was playing when he walked past my laptop the other day. 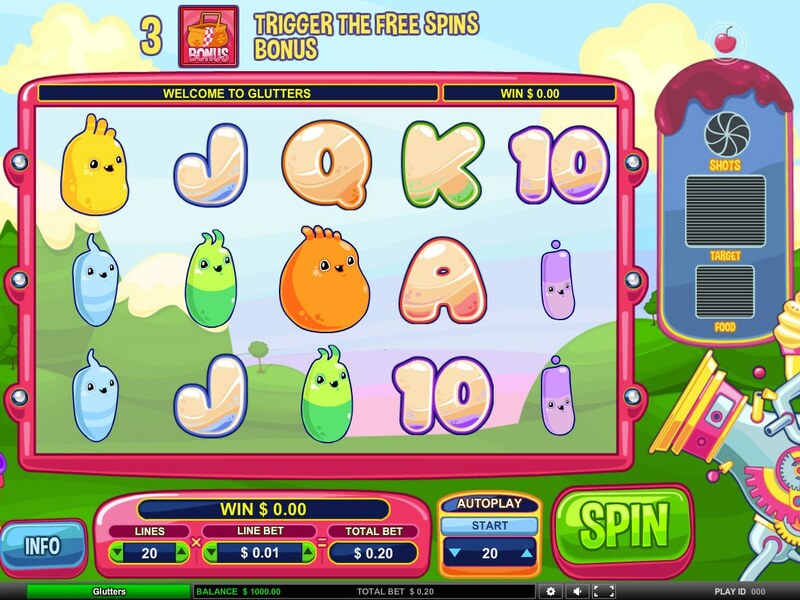 No, not the latest CBeebies online game, but a bizarre, childlike game from renowned slot developer Leander Games called Glutters. In case you’re wondering what glutters are, they’re multicolored amorphous blobs (who look like they’ve fallen out of a Manga cartoon for toddlers), burping and eating their way across 5 reels and 20 pay-lines. Gotta Get Those Glutters Fat! The ‘Food-canon’ (sic) is randomly triggered and shoots 1, 2 or 3 yummy ice cream and jelly concoctions onto the reels during the base game. In each shot, a target (one type of glutters) and ammo (food) are randomly selected. Each type of food makes the glutters get fatter. The fatter the glutter gets, the higher the payouts. Look out for the red Glutter who acts as the game’s Wild and substitutes for all symbols other than the Bonus symbol. When betting at the top betting of $10 a coin, five red Glutters will bag you a $5,000 jackpot. When three Bonus basket symbols appear on reels 2, 3 and 4 you will enter a round where five Glutters are ready to be fed. 5 free spins are rewarded by default, then you get to choose a Glutter to be fed who gets fattened up as your spins total increases. If a bomb is chosen it explodes, and your pre-spins round ends. 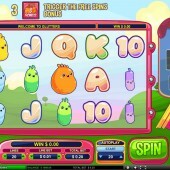 You will then progress to the free spins round to use up your freebies. The Food-Cannon will be activated during the free spins. I do find it amazing that such child-friendly slots get released. Is there some kind of nostalgic bent among slots developers who compete endlessly to recreate people’s childhoods? I’m not sure, but if ever there was a game to initiate some kind of psychological research into online slots players’ psyches, it’s this slot. If you’re turned on by bright colors, kiddie graphics and tinkly music, switching on Nickleodeon aside, get your asses over to an online casino near you and hunt out GameOS’s kitty-themed slot, Jour de L’amour, or the penguin-filled madness of iSoftBet’s Arctic Ace; both games are fun and breezy.